My relationship advice to you is to focus on the time spent on the endeavor and fore-thought that really captures a woman’s heart. Early in a relationship, there is timing to it all. Men who do too much too soon appear needy and unattractive. It’s important to find out what your woman/partner likes and follow through on that knowledge. For instance, you find out that a woman you started dating loves a certain type of music such as Jazz. A good follow through would be to suggest going to a jazz club for a date or a jazz concert or buying her a CD (if she has a CD player) of one of her favorite Jazz groups. You want to be careful not to appear too “over the top”. I had an experience where I met someone for dinner even though this was our first meeting from online dating and he brought me a big bouquet of flowers. I was very uncomfortable because I didn’t know him and it was a public place where people were assuming we were a couple. My relationship advice to you is to find out what is appropriate given the circumstances. When you show the right attention, then the woman in your life will be responsive to you and will either start to connect with you or will connect more fully with you over time. You will both feel more fulfilled in your relationship. What has worked best for you to connect with your love interest? What relationship advice can you share about the mistakes have you learned from? Women, what would you want the men to know about you? This curious coach would like to know! PS. 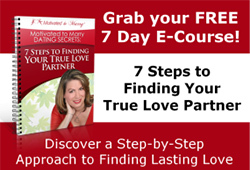 If you want to discover the major reasons holding you back from finding true love, then join me for my upcoming free teleclass on June 11th at www.motivatedtomarryfreeteleclass.com. Looking forward to having you on this live call! ‹ How Resilient Are You In Your Quest to Find Your Mate?